AirPhoton and Phoenix Operations Group are the newest bwtech@UMBC companies to win Maryland Incubator Company of the Year (ICOY) awards. 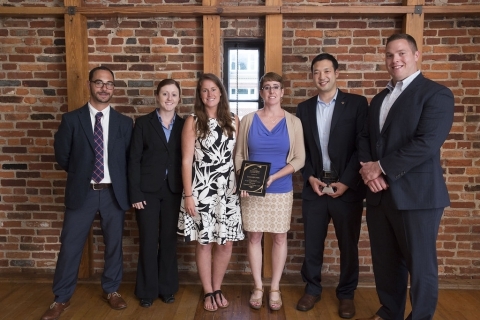 AirPhoton won best technology product company, and Phoenix Operations Group won best data analytics company at the awards event held June 21 at the American Visionary Arts Museum. 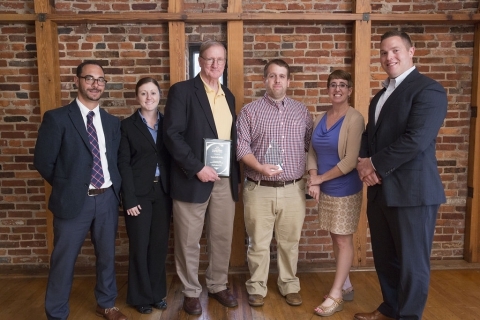 Six other bwtech@UMBC companies were recognized as finalists. AirPhoton produces customized scientific equipment for air quality data collection. The instruments they build are employed on the ground, in aircraft, and on satellites. Phoenix Operations Group offers data analytics, cloud application design and administration, and platform optimization services to the intelligence community. Devin Edwards, director of strategic development, says the research park has served the company well. Header image: Andy Jones gives the event’s key note. Other images: AirPhoton team members accept their award (top) and Phoenix Operations Group team members accept theirs (bottom).